On January 4, the Hinode satellite captured these breathtaking images of an annular solar eclipse. 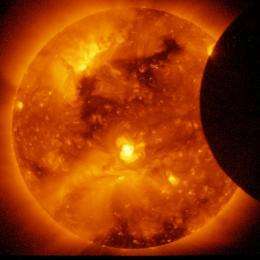 An annular eclipse occurs when the moon, slightly more distant from Earth than on average, moves directly between Earth and the sun, thus appearing slightly smaller to observers eyes; the effect is a bright ring, or annulus of sunlight, around the silhouette of the moon. Hinode, a Japanese mission in partnership with NASA, NAOJ, STFC, ESA, and NSC, currently in Earth orbit, is studying the Sun to improve our understanding of the mechanisms that power the solar atmosphere and drive solar eruptions. 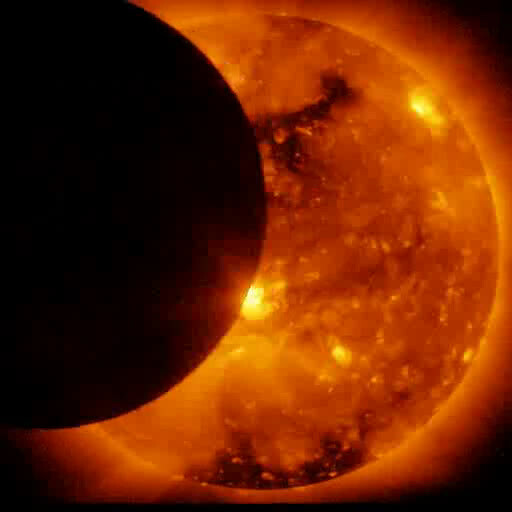 This timelapse shows an annular eclipse as seen by JAXA's Hinode satellite on Jan. 4, 2011. An annular eclipse occurs when the moon, slightly more distant from Earth than on average, moves directly between Earth and the sun, thus appearing slightly smaller to observers' eyes; the effect is a bright ring, or annulus of sunlight, around the silhouette of the moon. Hinode, launched in September 2006, uses three advanced optical instruments to further our understanding of the solar atmosphere and turbulent solar eruptions that can impact hardware in orbit and life on Earth. The joint Japanese-American Hinode satellite, currently in orbit around the sun to study the magnetic fields and energy mechanisms of Earths parent star, captured this breathtaking image of an annular solar eclipse on Jan. 4. 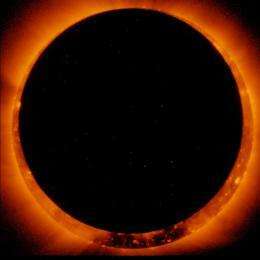 An annular eclipse occurs when the moon moves directly between Earth and the sun, but appears slightly smaller to observers eyes, creating a bright ring, or annulus, around the silhouette of the moon. Hinode, launched in September 2006, uses three advanced solar telescopes to further our understanding of the solar atmosphere and turbulent solar eruptions that can impact hardware and life on Earth.